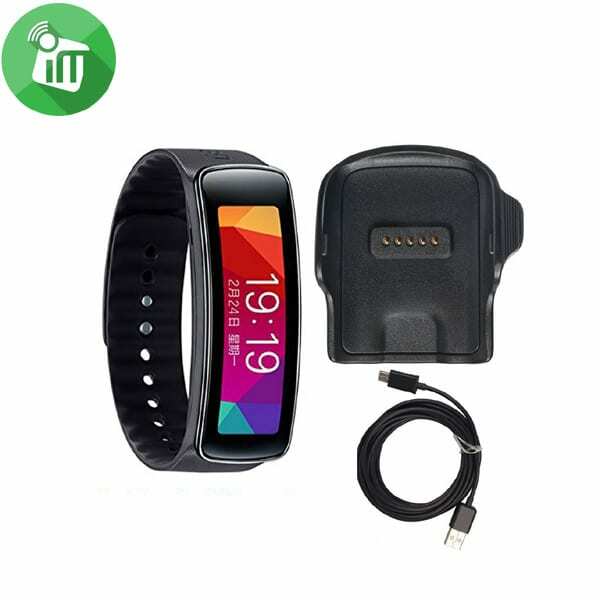 Charges compatible devices to up to 80% in just 35 minutes. 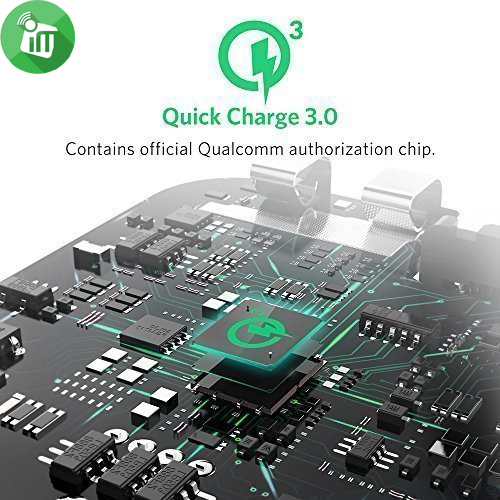 Qualcomm QuickCharge 3.0 is 38% more efficient than its predecessors QuickCharge 2.0: Save time and money with fast loading. 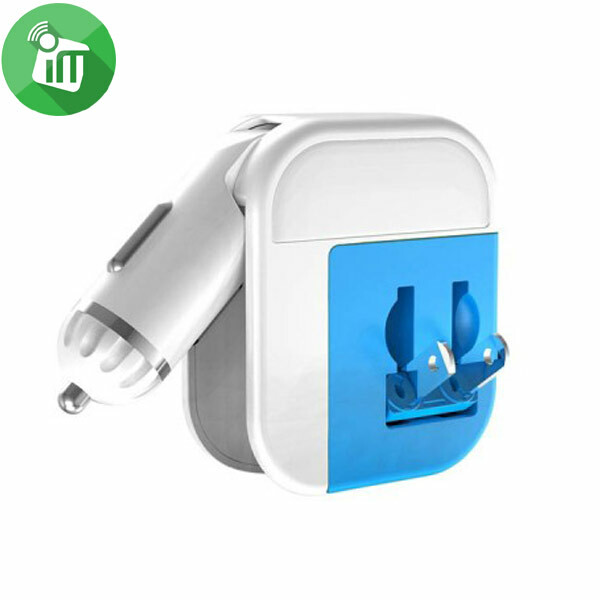 The compact size and international volt compatibility (AC 100-240V) make this charger the ideal travel companion. We at Anker believe in our products. 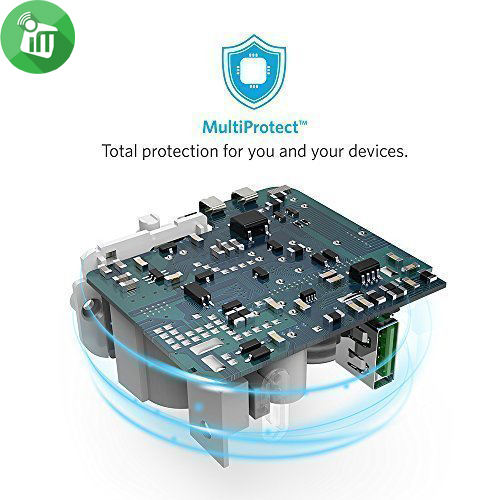 That’s why we provide all with an 18-month warranty and provide friendly and fast customer service. 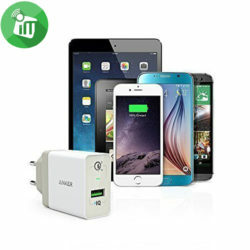 What You Get: Anker PowerPort+ 1 Quick Charge 3.0 Wall Charger, 3 ft Micro-USB cable, welcome guide, our worry-free 18-month warranty and friendly customer service. 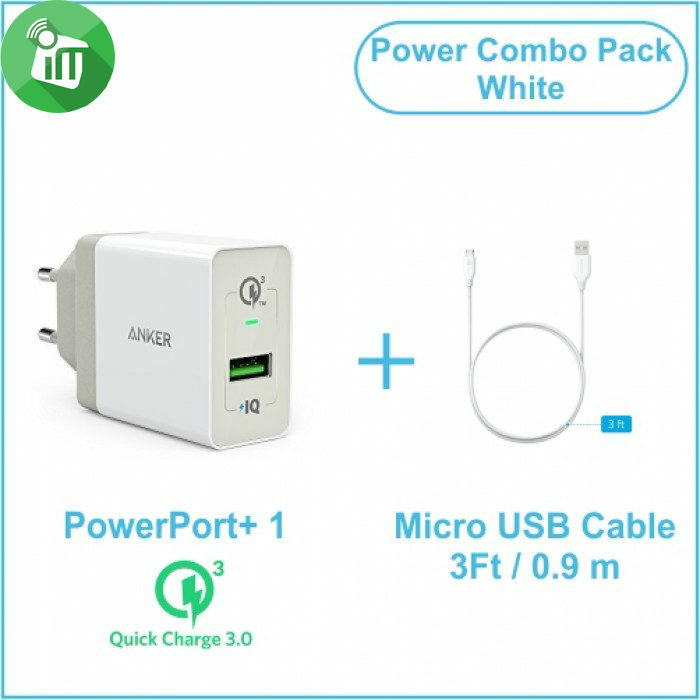 Note: Apple devices and other devices that will not support QuickCharge, thanks to Anker’s exclusive FastIt technology PowerIQ nevertheless with the fastest possible charging speed of up to 2.4A max. loaded. With a Type C to Type C cable, USB C devices such as the Nexus 5X and 6P, Oneplus 3 a quick charge. With a Type A to Type C cable, only regular loading speeds are possible. 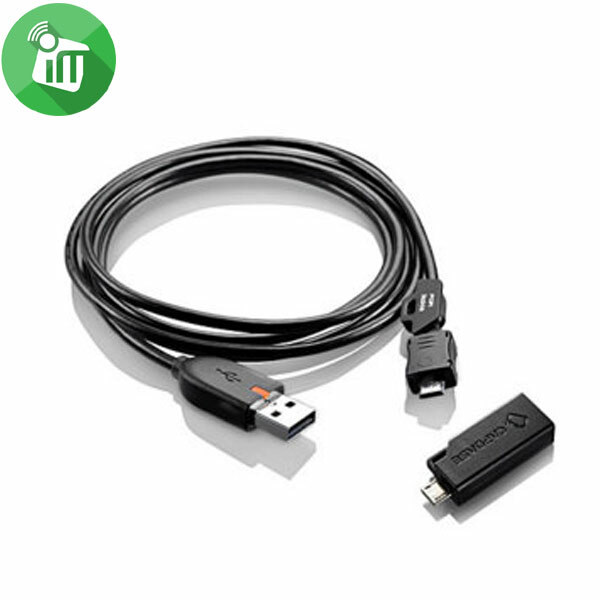 – Use your original cable or a cable from a certified third party supplier (eg MFi). Compatibility Galaxy S6 / Edge / Edge Plus, Galaxy grade 5/4 / Edge. LG G4 LG G Flex2. Nexus 6. HTC One M8 / M9. Droid Turbo. Xperia Z3 / Z3 Compact / Z3 Tablet Compact / Z4 Tablet. 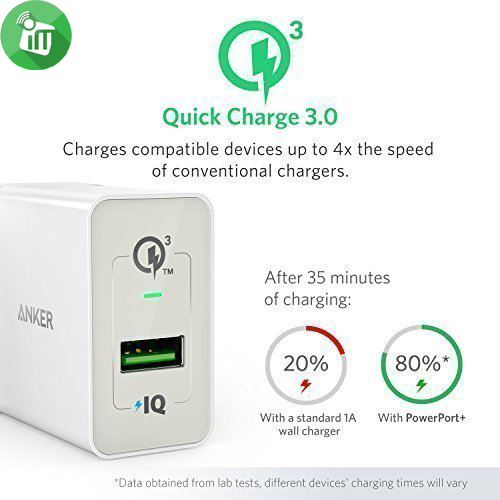 Other features Fast-Charging Technology: PowerPort+ 1 guarantees the fastest possible charge to any smartphone or tablet, thanks to Quick Charge 3.0 and PowerIQ technology. 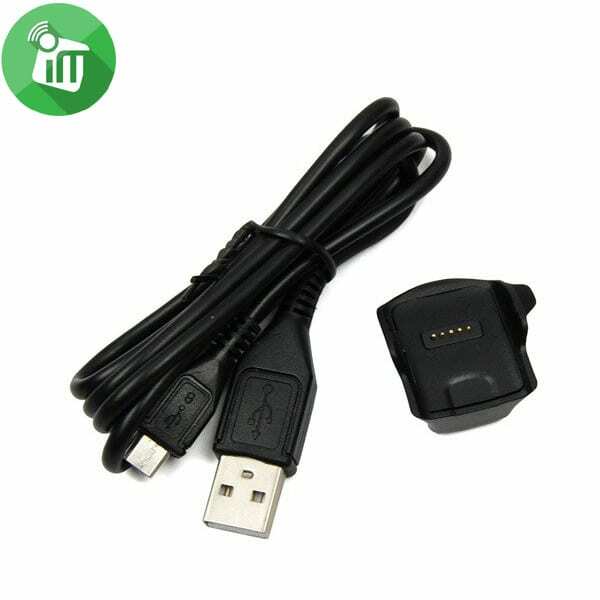 Supreme Compatibility: Backwards-compatible with all versions of Qualcomm Quick Charge technology (1.0, 2.0 and 3.0). 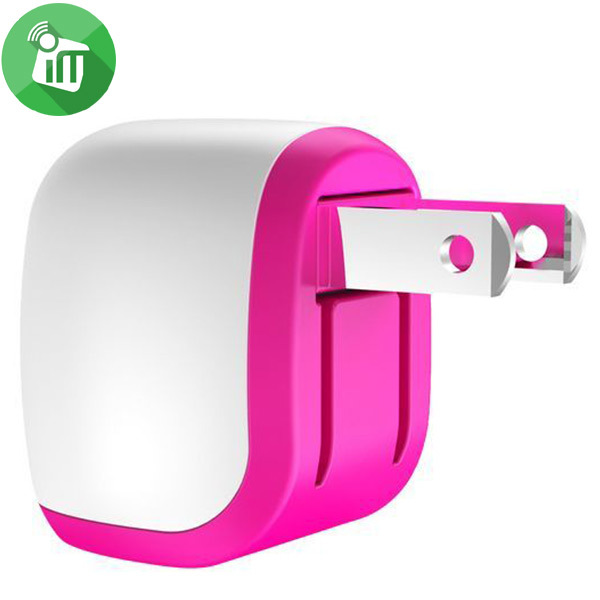 Also charges non-Quick Charge devices at up to 2.4A. Safety First: Exclusive Anker technology provides surge protection, temperature control and more advanced safety features, keeping you and your devices safe. 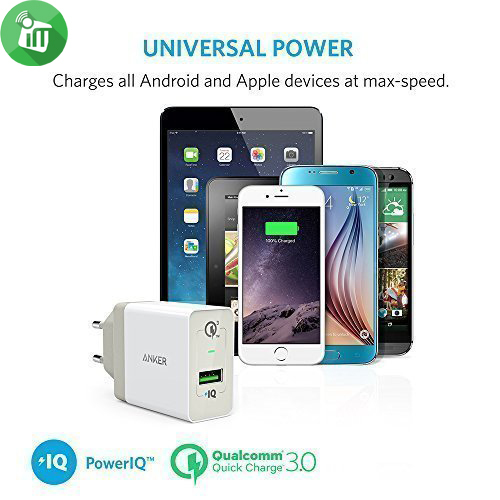 Qualcomm Quick Charge 3.0 Guarantees the fastest possible charge to any compatible phone or tablet, charging a phone up to 80% in 35 minutes-up to 4x faster than standard chargers. 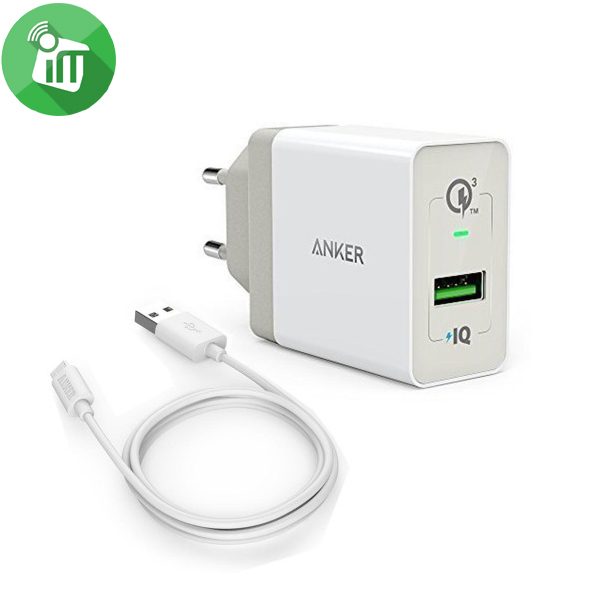 Unrivaled USB Efficiency Qualcomm Quick Charge 3.0 is 38% more efficient than the previous version, Quick Charge 2.0. That means less time waiting around and more time for you. Not compatible with iPad Pro. For Nexus 5X and 6P, only regular charging speed is possible using a USB-A to USB-C cable. 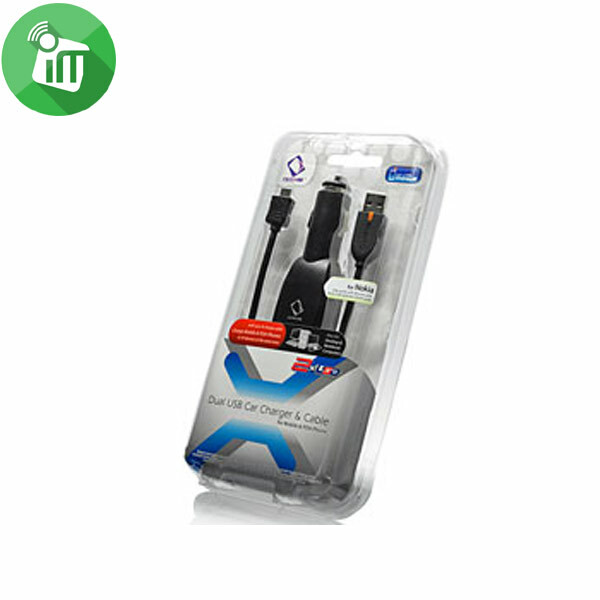 For Optimal Use: – Use your original cable, or one certified by a third party (such as MFi). 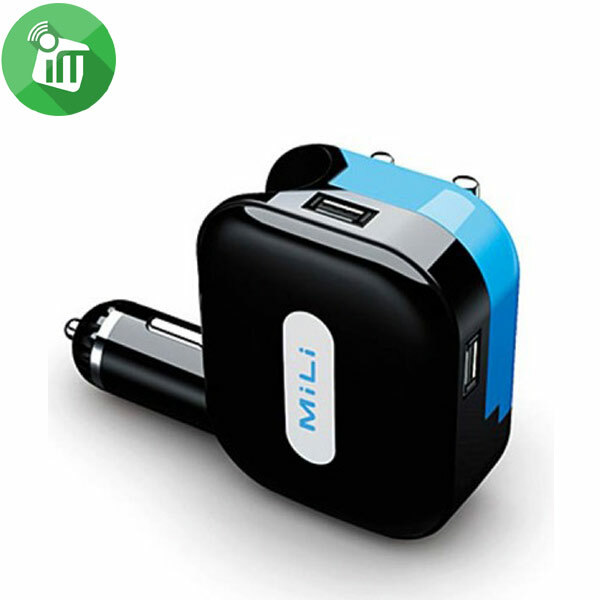 The innovative design of car, travel and USB charger. AC/DC input, with 2 USB output ports, charges two different devices simultaneously. Input: 100 to 240V AC, 50/60Hz. Output: 1 USB 5V DC/2.1A. 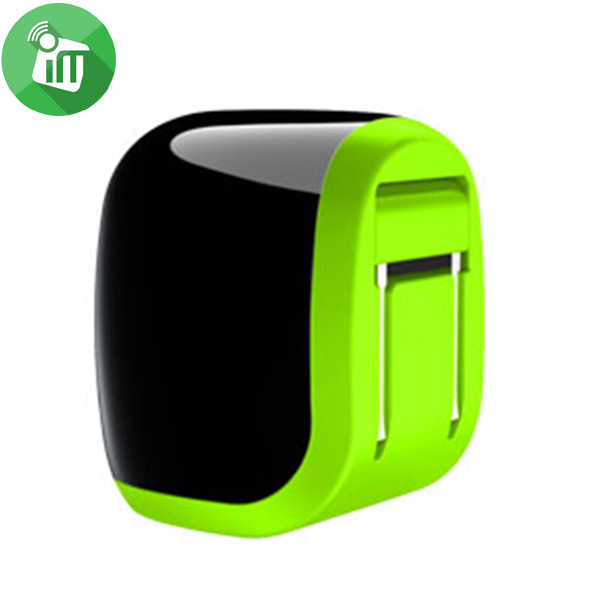 It can charge most USB devices, including iPads, iPhones, iPods, MP3, MP4, MP5, and other mobile phones.